This attractive little Blakeney Summerhouse blends in marvellously well in this customer’s garden in Bottisham, Cambridgeshire to use as a garden retreat to enjoy in the summer months. The Blakeney is a chalet-style summerhouse with an apex roof, and a roof overhang over the front gable. There are fully gazed double doors in the front gable and two windows sets, and another window set on each side of the building (the top windows in these sets can be opened). 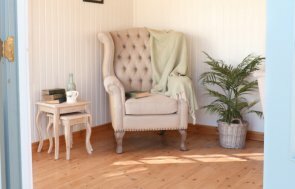 Heavy duty felt has been used on the roof, and the summerhouse has been painted in the colour Sage, which is a natural green from our Valtti colour range: Valtti is a multi-layered, opaque paint system that offers a long re-decoration cycle (dependent on your local conditions). On the inside of the summerhouse, the customer opted for only the floor to be insulated, which may mean that they have plans to insulate the walls and ceiling themselves at some point. 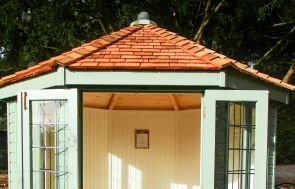 If you like this style summerhouse, you may be interested in knowing about our Morston Summerhouse as well, which is exactly the same design, apart from the addition of a 1.2m deep veranda on the front, which adds another useful dimension to the design. For more information, you can call us on 01760 444229 to speak to our helpful team, send us an online enquiry with any questions you have and we’ll happily answer them, or, if you are located close to any of our six Show Centres across the country, you can come and see our quality timber buildings for yourself.